The Biopharmaceutical Development Program (BDP) has produced several grams of clinical-grade recombinant human interleukin 15 (rhIL-15) for various clinical indications. rhIL-15 is a T-cell growth factor that is proposed to have clinical applications that are similar to, but potentially safer than, IL-2. BDP scientists developed an efficient and scalable manufacturing process utilizing the latest process analytical techniques and bioprocess strategies to ensure a very high product quality and yield. Two additional studies were recently initiated. One, sponsored by Steven Rosenberg, M.D., at NIH, involves rhIL-15 stimulation of tumor-attacking immune cells (lymphocytes) that are transferred to subjects following chemotherapy for metastatic melanoma. The other study, sponsored by Jeffery Miller, M.D., at the University of Minnesota, uses rhIL-15 to stimulate a specific kind of immune cells, known as natural killer cells, in stem cell transplantation in leukemia patients. Soon, the Cancer Immunotherapy Trials Network will initiate a multi-site study involving subcutaneous (below the skin) rhIL-15 administration in cancer patients. All of these studies will examine different ways to safely administer rhIL-15 and achieve a therapeutic response. Specific information on these clinical trials can be found at http://www.clinicaltrials.gov. 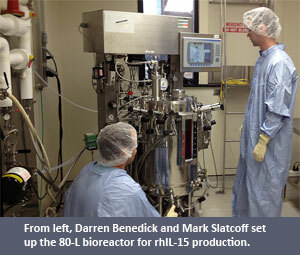 BDP is producing rhIL-15 for NCI at Frederick National Laboratory for Cancer Research. Information on the availability of rhIL-15 for research may be obtained from Jason Yovandich, Ph.D., program director, Biological Resources Branch, NCI.